This has been my baby for a few months now. I was working on another gamemode that I called LifeRP but it was taking a while and wanted to work on something that would be easy to work on and have a simple goal, to see how I would "complete" a coded, functional gamemode. I feel that this is in a polished enough state to be super public, used, and abused. 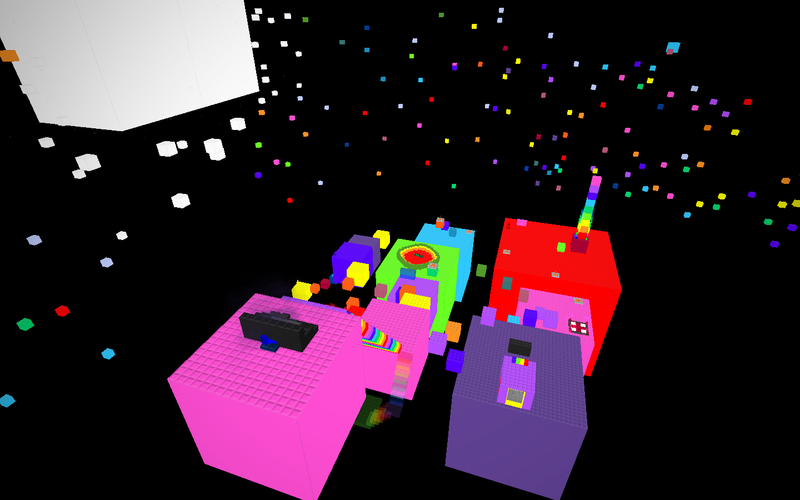 This is a work of love for the Blockland game and for my newfound abilities to program. 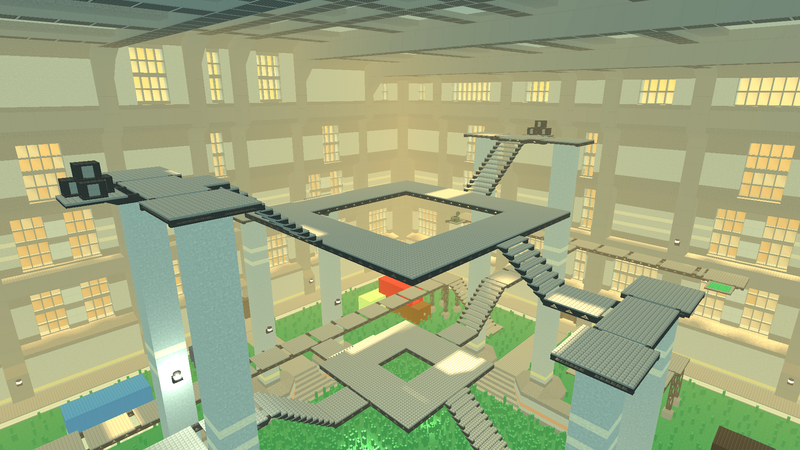 This was made after not seeing many simple or 'classic style' deathmatch games on Blockland for quite a while, and was fearing that the death of Blockland's own style was imminent, so I tried my hardest to create a new, easy to use, play, and host, gamemode. The aim of the gamemode is to provide a classic/fast/action/arcade/default/doom style experience, while being as plug and play and expandable as the default SpeedKart gamemode. Full credits can be viewed ingame with the /dmCredits command. There's a lot of integrated add-ons and code files. The default SpeedKart gamemode was used as a base when I created this, and as a result that grants you the power of map rotation! After 5 (by default) rounds, the current build will be cleared, and another build will be loaded. You need add-ons prefixed with "DeathMatch_" that contain saves for this to work correctly. You can find a lot at the bottom of this post. Changes have been made to the map rotater to add more map-specific features. Each map can now have a unique weapon loadout i.e. a city themed map could start you with a gun while a castle themed map could start you with a sword and a bow. Each map can also specify if water instantly kills, and the main music of the map which will always play on the first round. You can also vote to change maps. 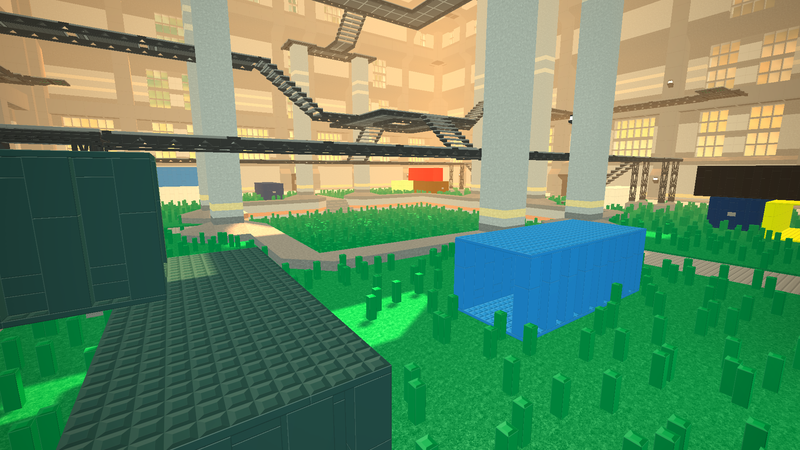 A playertype, named "Deathmatch Player", has been custom made for this gamemode. It has speeds comparable to the Quake-Like player, but retains the jump height of the standard player. As a bonus, it can also crouch jump, adding a half-life twist to it. Each map can be sorted and themed, and you can choose to restrict the map rotator to only loading maps of a specific category/theme/both. Many classic and default styled weapon add-ons have been integrated into the gamemode. You don't need to download them, they are fully integrated into the gamemode as part of the code.There have also been a few tweaks to these weapons. Even the default weapons, including a weaker throw for the spear if you release it early. Again, you do not need to download any extra add-ons for these features, they are part of the gamemode's internal files. The gamemode features harmful versions of the default tools, allowing you to add them to weapon loadouts. There's also an edited rocket launcher that fires cannonballs. There's also a blockhead ray that turns non-blockheads (like horses) into blockheads, a pong gun, and a pinball launcher. Keys now show up in your HUD, and are never added to your item inventory. You can use keys just by activating bricks normally. This allows you to open locked doors for example without needing to switch to a key item. Each round plays a random song based on the map's theme. Maps can also specify their main music, forcing it to play in the first round and adding it to the randomiser for that map. This can be disabled. If you dont want to download music files, you dont need to! The deathmatch gamemode will check if you have the music files, and will go into a musicless mode. Each round can have different gameplay styles, with set loadouts and playertypes. 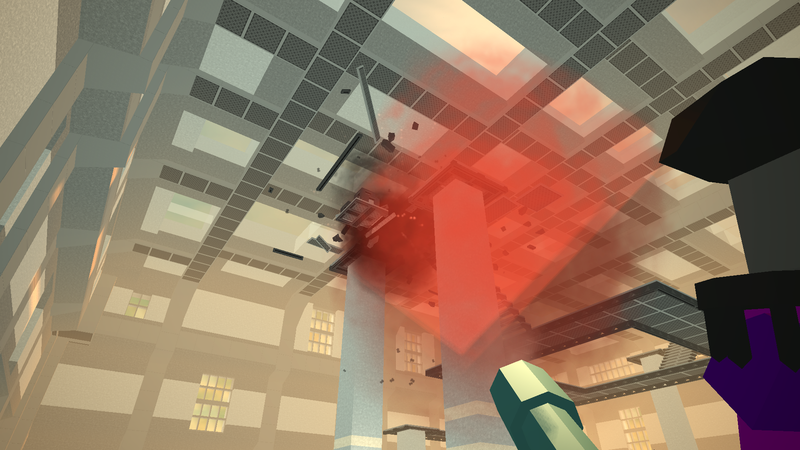 Version 7 of my Crouch Jump server script is fully integrated, adding to the FPS-like gameplay. This also means you won't have to download my script for this gamemode to work. Player_Half-Life is also included. You must have at least 1 map, otherwise you're going to be fighting in an endless ocean which does not change ever, which is not fun. See below for a whole bunch of maps. A rather large enclosure built with sniping and explosives in mind - weapons are enclosed in crates and containers that must be blown up to be accessed. 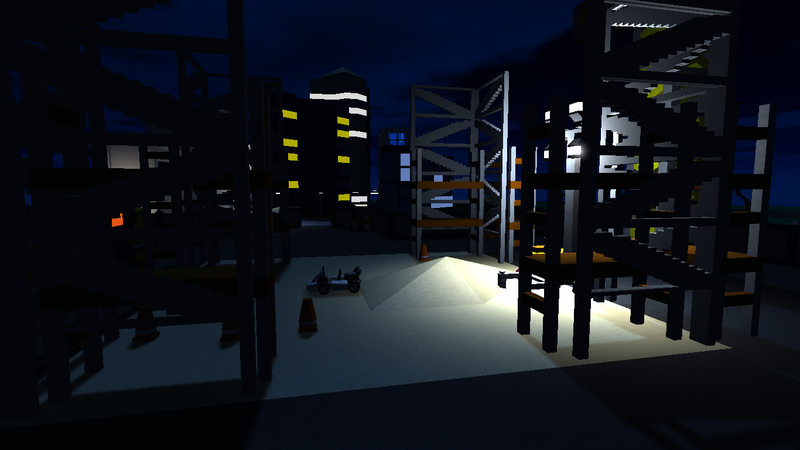 Areas from SpeedKart tracks retooled to work as DeathMatch maps. A few maps, featuring Slate, Office, and CUBE. This is a simplified and smaller version of DeathMatch GameMode. Create/find/edit a save using only default brick add-ons. Create a description.txt and put a small description in it. Use only one line. This file is unique to deathmatch maps. Create a config.txt. Expanation is provided below. This file is unique to deathmatch maps. 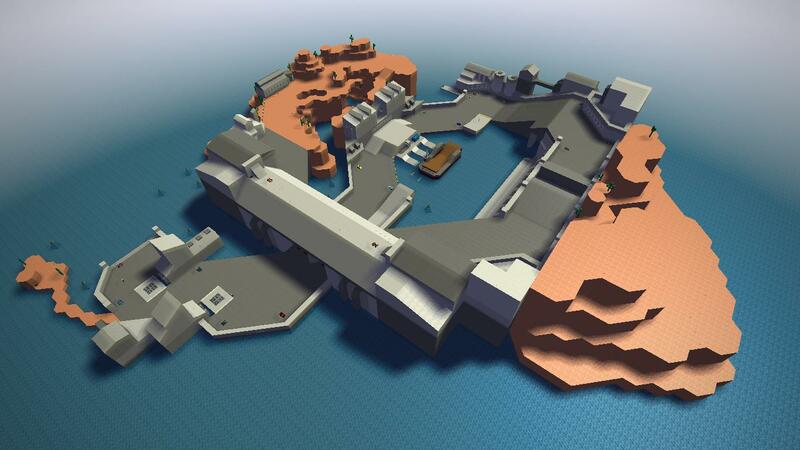 Make a new zip file and name it "DeathMatch_My_Cool_Map.zip"
Start the gamemode up, disable map rotation, clear all the bricks, (you dont want to be building with public bricks, and vehicles are broken with public bricks in singleplayer) leave the minigame, load or just start building a map. Being outside of a minigame will make you immune to the gamemode's instant kill water effect. The gamemode will also load the newduplicator and fill can if you have them, and will also let you execute 5 more add-ons, which you can use to assist in building. Another benefit of making a map inside the gamemode itself is you can easily spawn any item the gamemode has into the map. You still need to manually create your config.txt however. item0 - The first item players start with. Defaults to nothing. item1 - The second item players start with. Defaults to nothing. item2 - The third item players start with. Defaults to nothing. item3 - The fourth item players start with. Defaults to nothing. item4 - The fifth item players start with. Defaults to nothing. item0alt - The first alternate item players start with. Defaults to nothing. item1alt - The second alternate item players start with. Defaults to nothing. item2alt - The third alternate item players start with. Defaults to nothing. item3alt - The fourth alternate item players start with. Defaults to nothing. item4alt - The fifth alternate item players start with. Defaults to nothing. allowAltLoadout - Enables the second item loadout. The gamemode will pick between each weapon per slot randomly, this includes empty slots. sort - The category of the save. Defaults to "Unsorted". Underscores must be used instead of spaces. theme - The theme of the save. Defaults to "Themeless". Underscores must be used instead of spaces. brickDamage - Set to true to enable brick destruction. Defaults to false. music - The main theme of the map, which forces the song to play in the first round. Optional. musicAll - Forces the main theme to play for every round if set to true. killWater - Forces the environment water to the default height and has it instantly kill players if set to true. teamColor1 - The color of the first team. teamColor2 - The color of the second team. teamColor3 - The color of the third team. teamColor4 - The color of the fourth team. force2teams - Set to true to force all team rounds to have only two teams. force4teams - Set to true to force all team rounds to have four teams. Type one of these after itemX or itemXalt in your config.txt. These are valid words used to set the teams' colors in your config.txt. Setting your maps to one of these themes will make the gamemode play music that should be fitting for that theme. are all supported by the gamemode and will play select songs. You can still type in anything else if you want. The gamemode will completely randomise the music in this case. Underscores _ are replaced with spaces ingame. 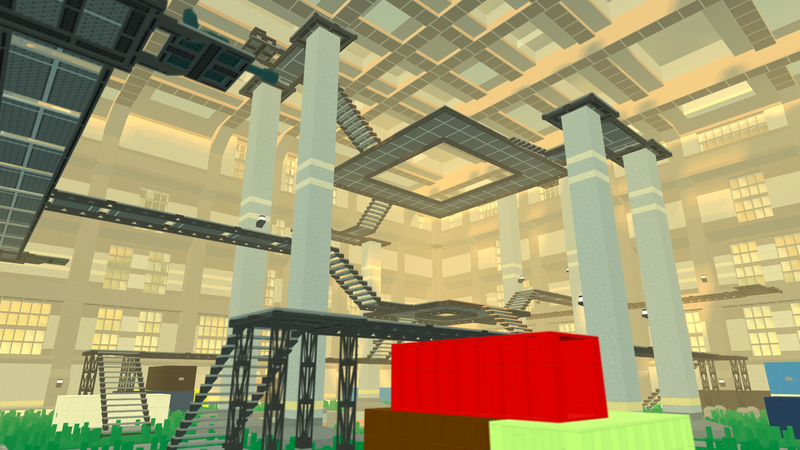 sort Super_Cool_MapsThis will result in a map that spawns players with a gun, and can be categorised with "Super Cool Maps". It will also be "Themeless" as no theme was provided, which is perfectly fine if your map has no real theme going on. You're going to want to have spawn points all over the map, and you might want to have a way to keep players enclosed, like invisible walls or full interiors. Open maps will lava or kill water should be fine without invisible walls. If you want to enable brick damage, make sure the players cant escape or do anything weird by fake killing your bricks. If you're going to have ladders or other climbable objects, please dont require players to click on them, use onPlayerTouch instead. I feel it helps fast paced gameplay, and doesn't require players to have to stop and click on a bunch of bricks accurately. Leave the lower ladder steps unevented, so the players have to jump to start climbing the ladder. Try throwing some keys in your maps! Only a few maps make use of the key system, which is a real shame as it's a really cool system. It would be cool to have more maps with unique themes! There's only 1 ice map, 1 egypt themed map, and it would be cool to see a wild west themed map. Maybe even some space maps, like on a ship or a space station. Go crazy with it! - Kill water forces the water height into a set number, this was done so normal water bricks would still be functional and not kill. - Vehcles dont spawn in singleplayer, unsure why. - The way music is handled in the gamemode is very hardcoded, but if it doesnt know what the map's theme is it will just play a random song based on the songs it knows about. Want to discuss the DeathMatch gamemode or get in direct contact with me? Join my Discord server! 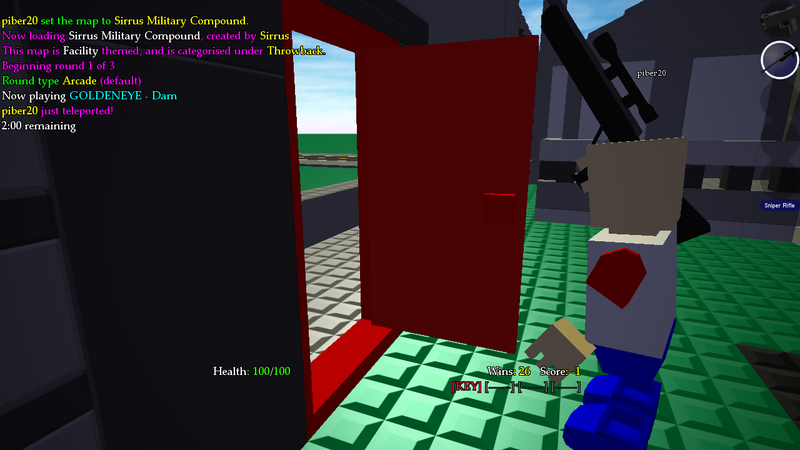 This image also shows off the key system, you can see me opening the locked door even though I'm holding a sniper rifle. That's because the keys are no longer added to your inventory, they instead set a client variable which will let you trigger locked objects. The hud will tell you if these client variables are set. You only need to click or press your paintcan button (default e) to trigger locked objects. Also there are more ways to get points, though compared to killing players for 100 points it's not that effective. You get 1 point for finding a treasure chest and you get 1 point for killing a bot. Randomised loadouts and playertypes are a thing now, though I don't want to completely copy scenery's battlemix or visolator's(i think) randomiser. Currently I'm only going as far as to pick 3 random items and pick a random playertype from a list. As a result of these randomised round types, I may add a few more item add-ons to the gamemode, but again I don't want to copy battlemix or randomiser, so I only want default styled/ classic weapons, nothing too over the top or too much of a gag. - Those gray [------] hud things are removed. They were being used to represent spaces where the key stuff would go, but I decided it was unneeded. Key text will still show up there. - I've changed a few things around in the code and added a new pref to allow changing the default round type. This works even without the random round type picker, so you could set it to Randomised and have every round be the randomised round for example. Going to host this tonight! Sounds cool! I may submit an update soon, though. The random round type might make it more fun, along with the weapon add-ons I'm adding. I found a few items in this rtb archive that I felt would fit in the gamemode. An airhammer, crowbar, magnum, shrink/grow ray (edited to use the printer model), SMG, and a homing rocket launcher. I'm also welcoming some ideas for what to add. I don't want over-the-top weapons or tactic00l weapons, and want them to fit with the classic theme I have going on. - On first starting up the gamemode, the rounds system may not work. - Balanced Random round type. 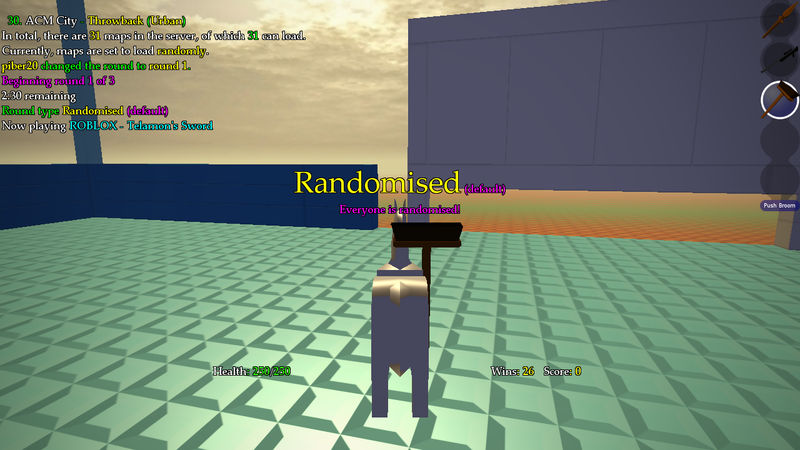 In the Randomised round type, it picks 3 random weapons and a random playertype for each player as they spawn, but one will always be a weapon that fires damaging ranged projectiles. In the Balanced Random round type, it still pickes 3 random weapons and a random playertype, but everyone shares these for the entire round. Because of this, we can take a risk and allow all the weapons to not be ranged ones, but one will always be a damage-dealing item in some way. 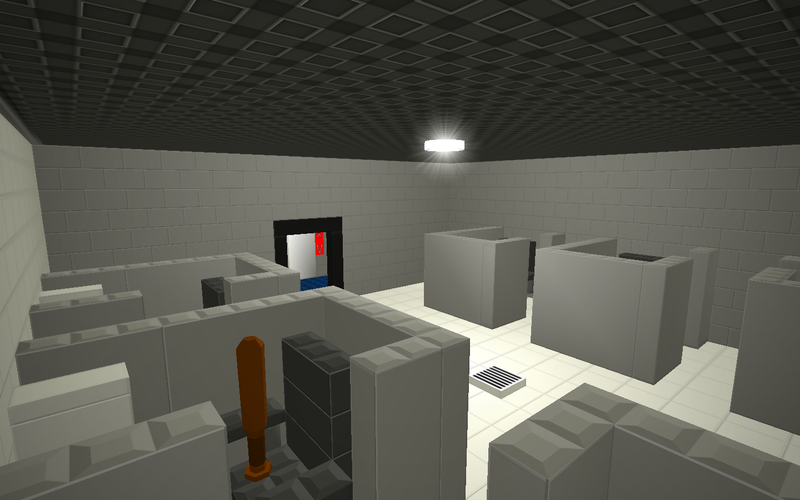 - Added my Half-Life-Like playertype. - Added new items including an airhammer, crowbar, magnum, shrink ray, grow ray, SMG, and a homing rocket launcher. You do not need to download them, they are integrated into the gamemode. I've also done a few edits and tweaks, like making the rays use the printer model. 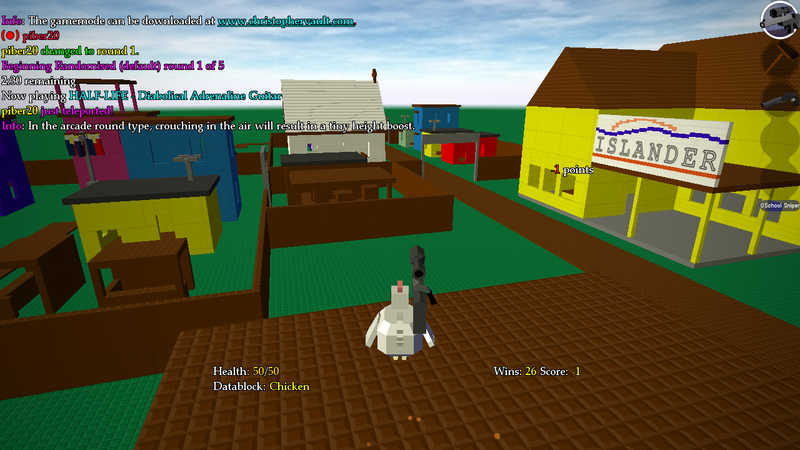 This also adds more options for map makers. - Changes to the game type system. Mostly internal code changes and optimisations, but this allows for the next addition. Allows a server admin to change the default round type to a different round type. - Added a tiny bit of recoil to the tommy gun and sniper rifle. This allows for smoother and higher jumps with the tommy gun, and the sniper rifle's recoil is just for cosmetic effect, its fire rate is too slow for its recoil to be useful. - Probably more I forgot. Whoops! Apparently something was broken, I need to remember to restart the gamemode before uploading instead of just executing code files to see the result. Anyway, now the gamemode should run. Redownload if you downloaded before this time. Also sorry for the triple post, just want people to be notified. Homing rockets are way too overpowered. Duplicate weapons are actually given quite often in randomised loadouts. - Edit code to remove a weapon if it discovers the player already has that weapon, will end up appearing to the player like they spawned with two random weapons instead of three. - Perhaps pick a random weapon from the map's loadout and place it in the fourth slot. Hah thanks. The word simple is more from the perspective of server hosters, I'm trying to make this an easy to host gamemode. Old School Weapons, with some edits to change the colors of weapons. Custom made Blockhead Ray, Pong Gun, Pinball L.
I've also done a lot of bug fixes and tweaks to make the gamemode more stable, including some edits to the maps so when I do an update be sure to redownload the maps as well. I might host this for a bit today just to see the current version in action before i release. Add a zombie mode, pretty self explanatory.